MUSCAT, Oman (AP) Less than three weeks after disqualifying himself for signing his scorecard wrongly in Dubai, Matthieu Pavon was in the headlines again but this time for leading the Oman Open at the halfway stage on Friday. 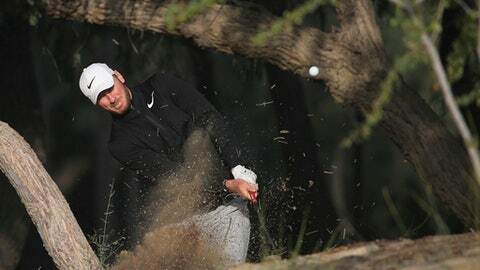 The 25-year-old Frenchman made seven birdies in his first 14 holes in Muscat, and then produced a fighting finish to save pars down the stretch and close on a 7-under 65. Pavon is 11-under 133 overall and holds a two-shot lead over Matthew Southgate (70) at the Greg Norman-designed Al Mouj Golf Club. England’s Southgate, joint leader overnight, had a double bogey after driving into the water on the 18th. Chris Wood (66) and Paul Waring (71), both from England, were tied for third on 8-under 136. Darren Clarke (67) went bogey-free to make his first cut on the European Tour since 2016. The Northern Irishman was at 5 under overall and tied for ninth place going into the weekend. Pavon, third in last year’s Scottish and Portugal Opens, went out in 31 with five birdies and then added three more in the next five holes, along with his only bogey on the par-3 13th. He produced a great up-and-down on the 15th after finding the fairway bunker, and then had an anxious time watching his tee shot curve just enough to miss the water guarding the right side of the 18th fairway. Southgate, who had surgery for testicular cancer in 2015, was happy with his performance despite the late hiccup on the 18th. ”I hit a poor swing and made a poor error and I’m kind of not surprised. It was a hot day and it has taken a lot out of me,” said Southgate.